FusionWMS is an advanced Inventory management system designed for Retail’s multi-location environments. FusionWMS simplifies, streamlines and enhances your accounting system’s out of the box processes. Its intuitive user interface allows direct access to your accounting system’s functionality from anywhere there is an internet connection – no duplicate data base, no syncing of data. Flexible hardware requirements include virtually any Windows CE device. FusionWMS does not require any on local software install other than on the handheld or in the case of the Ship Station – the touch screen interface. A small “gun server” application manages all FusionWMS communications and is installed wherever your accounting system resides. FusionWMS integrates in real time. No duplicate databases, no sync process. When receiving items at the warehouse, store, or distribution center it is imperative to have a quick and accurate count. Purchase Orders confirmed on the hand held device with items and quantities immediately verified eliminating potential errors. FusionWMS can receive in whatever unit of measure is stipulated on the PO. Regardless of whether scanning UPC codes or item bar codes, Fusion assures 100% accuracy. Once processed, printing inventory labels can be managed from the handheld with FusionWMS automatically discerning which items require labels and the quantity of labels to be printed. The receiver will automatically post into your accounting system. FusionWMS assumes that all receipts arrive at an inbound staging bin. This allows for inspection, labeling, cross dock, etc. From this location items can be independently put away. Scan any item in the receiving area and FusionWMS will direct the operator which bin to put items in. This can be overridden from the handheld if necessary. FusionWMS uses your accounting system’s bin management functionality. In addition, FusionWMS provides license plate functionality where a collection of items can be grouped and labeled. Thereafter the group can be managed by scanning the barcode label or license plate. These temporary collections minimize the potential for lost inventory during moves, transfers or shipping. FusionWMS empowers hand held users to independently look up bin contents or find items anywhere in the warehouse. This utility liberates the operator from management oversight and frees them up to be more efficient. Scan any item and all locations with the respective quantities for that item as well as any serial / lot detail will appear on the handheld. Likewise, scan any bin and all contents of that bin will display, in real time. All the serial and lot traceability available in your accounting system is available from in FusionWMS via a hand held device. Lots or serial numbers can be assigned when creating the shipment or during the picking process. In the case of the latter, the serial numbers or lots and quantities are updated in your accounting system in real time. Simply scan the Sales Order from the barcoded pick list and then scan items. FusionWMS will move the items to a shipping staging bin for shipment. FusionWMS enhances your accounting system’s Sales Order Pick function by adding multi Sales Order Wave Picking. Select multiple Sales Orders in and FusionWMS will sort and group the selected items by bin / item sequence. This allows the operator to make one pass through the warehouse collecting items for multiple Sales Orders. Those items can then be sorted at the shipping station. FusionWMS has multiple options for shipping. Manual Pick / Scan to Ship For many environments, multiple scans are too labor intensive. Simply print the pick ticket and manually assemble the items. At the shipping station items can be scanned for accuracy and to relieve the quantities from the stock bin. Scan to Pick / Scan to Ship Ideal for high value inventory, complex environments or wave picking; scan to pick, moves the items from their stock bin to the shipping staging bin where they are sorted or staged. A second scan (Scan to ship) confirms the shipment and relieves the shipping bin. Scan to Pick / Manual Ship In rare cases, items are scanned when picked and then confirmed manually to ship. Scan to pick moves the items to a staging bin and the ship function relieves this bin and confirms the shipment. FusionWMS adds the ability to use barcodes and conventional shipping and receiving processes for intra-company transfers. Select one or more transfer orders, print pick lists, ship i.e. issue to a transit location, receive, all using standard process and handhelds. Regardless of the ship method, FusionWMS engages your accounting system to automatically print all shipping labels and packing documents. FusionWMS extends this your accounting system functionality to remote locations with only an internet connection. The Fusion Physical Count module, allows you to quickly and accurately take physical counts across multiple warehouses, bins, and lots. 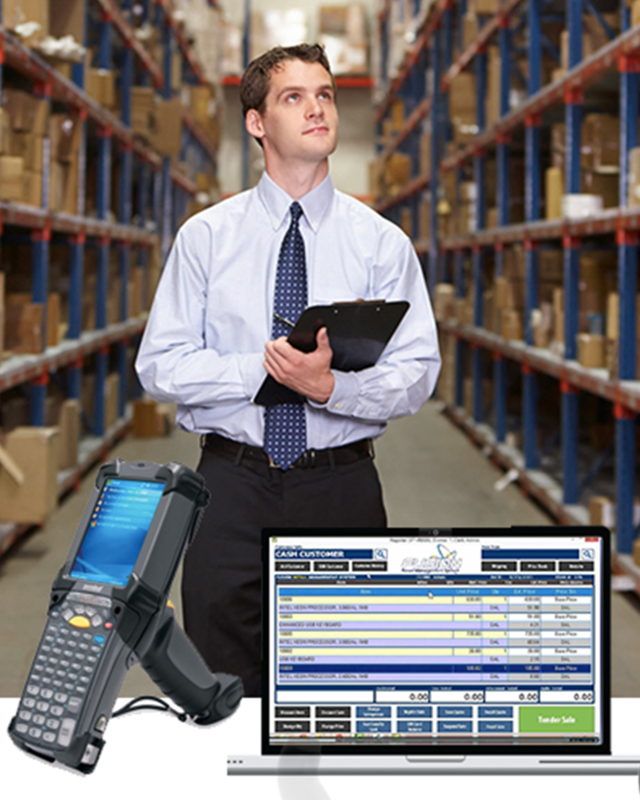 When you use Fusion Physical Count and an RF or Batch hand-held computer you can audit your inventory counts quickly and easily at any time, instead of waiting for the dreaded yearly count. This module will make your employees accountable and empower you to make changes to help your company eliminate lost and misplaced items. With FusionWMS you can print bar code labels for your existing inventory increasing efficiency. Print any number of labels at any time of virtually any size. Simply select a single item or range of items from your inventory master file, enter the number of labels you want printed (either a fixed quantity or let the printing module print labels based off of your current on-hand quantity) and click the PRINT button. It really is that easy!